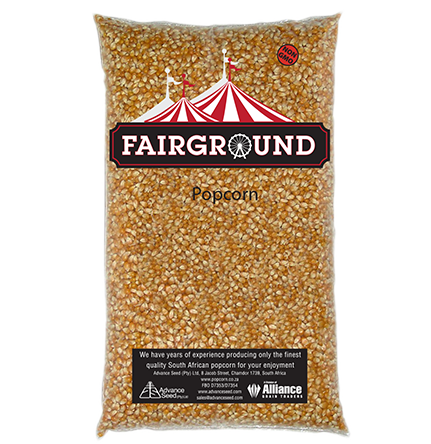 Owing to AGT Foods Africa’s unique location, it is able to harvest new crop popcorn from January every year, earlier than anyone else in the Southern Hemisphere. 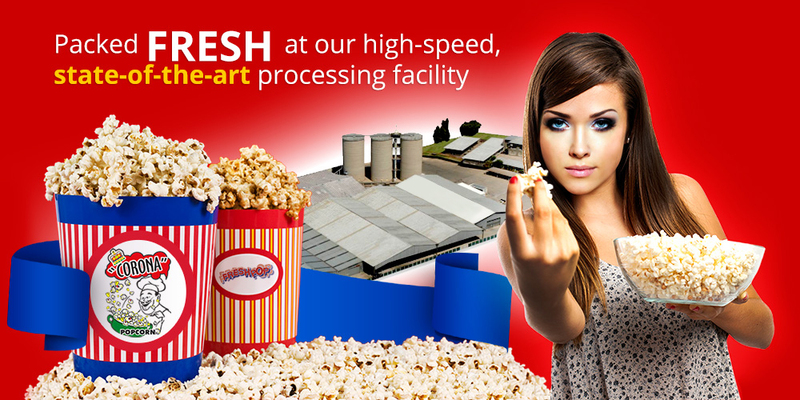 Furthermore, with AGT Foods Africa’s modern storage and State of the Art processing and packing facility, we can supply popcorn 365 days of the year. The whole process from planting to harvest is monitored by AGT Foods Africa’s qualified agronomic staff, ensuring only the freshest, premium popcorn is delivered to our Silos for cleaning and processing. 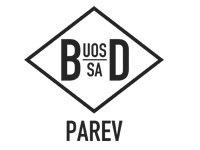 This ensures only the highest quality product is packed to meet our customers’ exact requirements, guaranteeing profitability every time they buy from us. 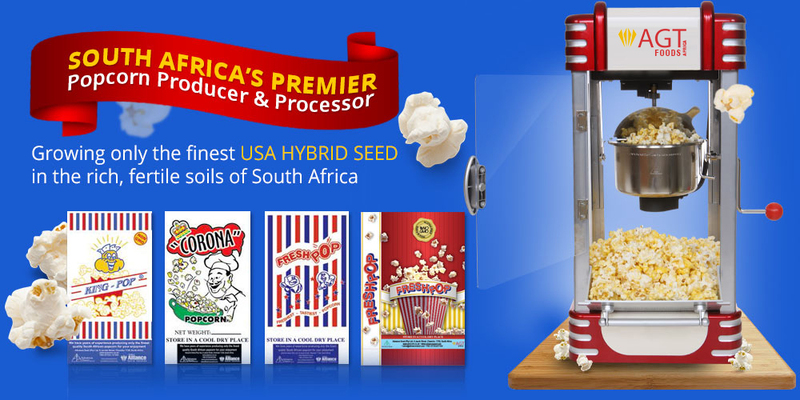 AGT Foods Africa offers two types of popcorn kernels – “butterfly” and “mushroom”. High expansion movie theatre premium popcorn. Air cleaned, sortexed and packed in multi layer paper bags or specially designed polypopcorn bags of 20kg/ 50lb (22.68kg) / 25kg or 1mt tote bags. We are also able to supply smaller poly retail packing of 250grm / 500grm and 1lb. 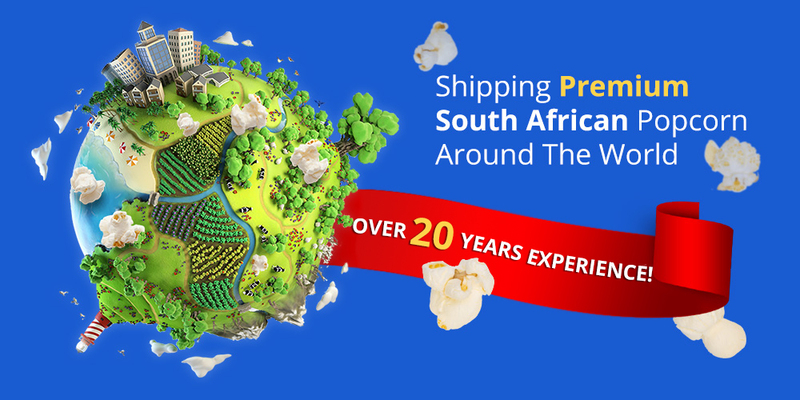 AGT Foods Africa popcorn is carefully packed and shipped break bulk or palletised in both 20 and 40ft containers to any destination in the world. 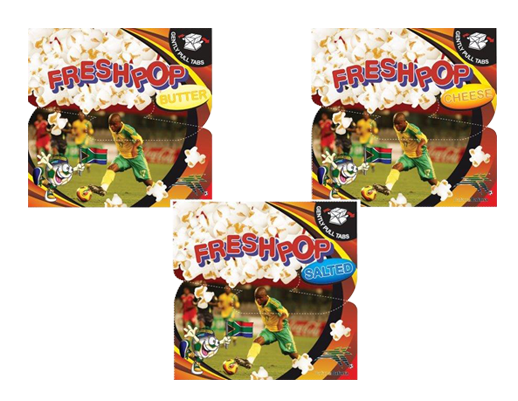 AGT Foods Africa pops big light, fluffy and tasty popcorn for maximum profitability and performance. Every load is test-popped several times with a Cretors Metric Weight Volume Tester (MWVT) before it is shipped to our customers. If it does not meet our standards we do not ship it. 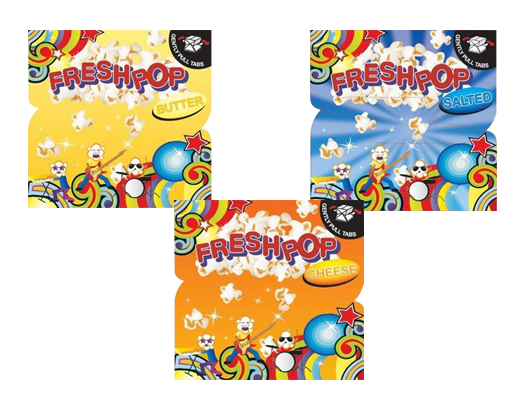 The finest flavourings and oils are combined with Freshpop in a highly sophisticated pop box that pops within 2 – 3 minutes in a microwave oven to produce an incredible taste experience. Dynamite absolutely positively ready to blow your taste buds. 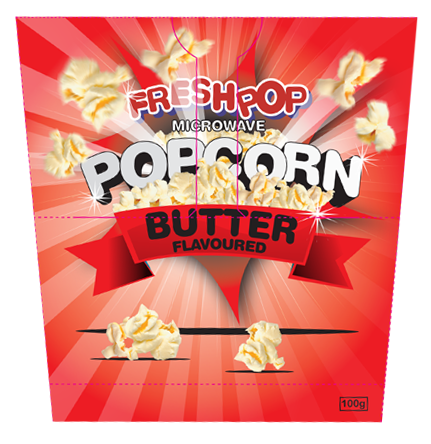 We can supply microwave packs of popcorn in your custom made private label / packaging or alternatively the Freshpop or Fairground brands. Multiple flavours available. Feel free to discuss other flavours. 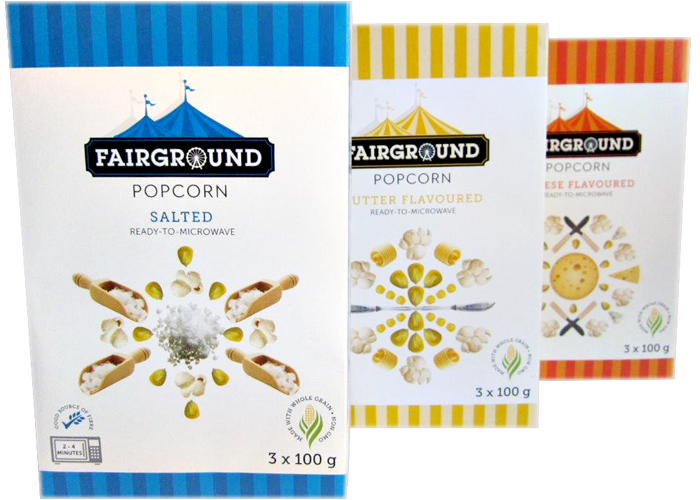 AGT Foods Africa also supplies the unique POP – UP BOX popcorn, it is supplied flat and once you place it in the microwave the box pops up, look at this link here. Each kernel of popcorn contains a drop of water stored inside a circle of soft starch. 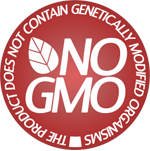 (That’s why popcorn needs to contain 13.5 percent to 14 percent moisture.) The soft starch is surrounded by the kernel’s hard outer surface. As the kernel heats up, the water begins to expand, and pressure builds against the hard starch. 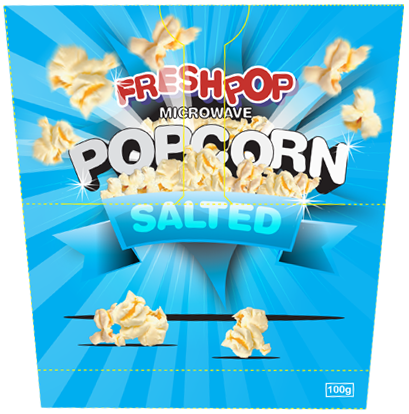 Eventually, this hard surface gives way, causing the popcorn to “explode”. 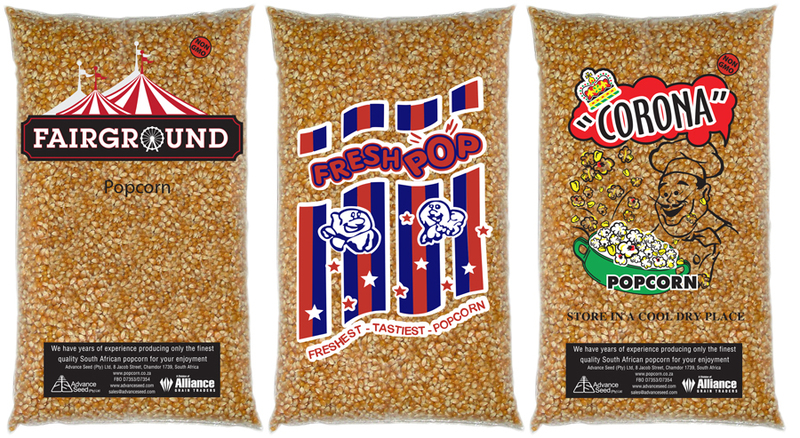 As the popcorn explodes, the soft starch inside the popcorn becomes inflated and bursts, turning the kernel inside out. The steam inside the kernel is released, and the popcorn is popped! 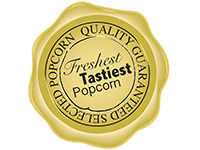 Storing Popcorn Properly Protects It’s “Popability”? 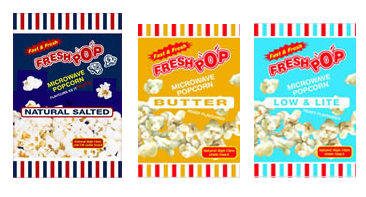 Without moisture your popcorn can’t pop. If left uncovered you can lose 1% moisture on a hot day. This doesn’t sound like much but if you lose 3% your popcorn will be “unpoppable”. 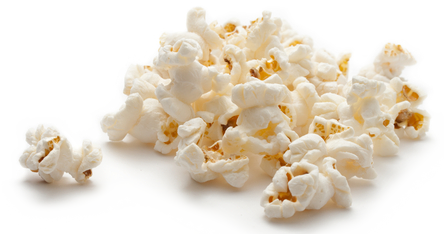 You should always store your popcorn in an airtight container – glass or plastic – to avoid losing moisture. Avoid the refrigerator. Most refrigerators contain little moisture and can dry out the kernels. Store it in a cool, dry place such as a kitchen cabinet. Teeth are composed chiefly of calcium and phosphorous. Both are dissolved…that is, eaten away…by a certain kind of acid, which is formed in the mouth by the action of bacteria on sugar. Thus anything containing sugar produced this acid which attacks the immediately. ‘Acids causing tooth decay form in the mouth from the use of sweetened foods, soft drinks, chewing gum, or other confections. In addition to its generous quantities of calories, protein, minerals and vitamins, popcorn supplies roughage and bulk. The roughage in popcorn beneficially exercises teeth and gums, a function not performed by soft foods. According to medical authorities, it also stimulates the flow of saliva and gastro-intestinal digestive movements. The bulk supplied by popcorn within the intestinal canal exerts mechanical stimulation of the motor machinery of the surrounding walls. For indigestion and ills that arise from over-eating, gas, etc., popcorn has always been a standard aid. 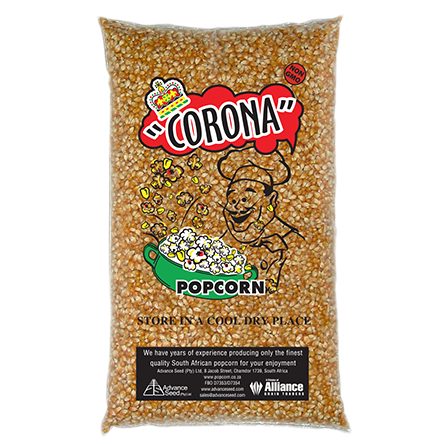 *One of the outstanding qualities of popcorn as a nutritious food is the abundance of essential minerals found in it. Three ounces of popcorn will supply a growing boy or girl with more than one-third of his or her daily requirement of phosphorous and one-fifth of the daily iron requirement…popcorn furnishes the human body with 2.7 milligrams of iron per 100grams of popcorn (edible portion). That is more than eggs, roast beef, peanuts, codfish, or milk, and is just short of spinach, which has 3.0 milligrams. Truly remarkable! With 281 milligrams of phosphorous per 100grams, popcorn is far ahead of eggs, beef, codfish, and spinach, and not too far behind liver and peanuts…Popcorn also supplies calcium…not so much as milk, the greatest of all calcium producers, but still more than man other producers, but still more than many other foods… The red corpuscles of the blood must have iron, and teeth and bones must phosphorous and calcium. Popcorn is a great source of these minerals. *Children need large supplies of calories in a balanced diet for their active bodies. Many foods supply calories in abundance…meat, eggs, cheese, and bread. But among the very best suppliers is popcorn! It has 404 calories per 100 grams (edible portion). That is more than any cooked meat or fish (except very fat meats), more than all vegetable, fruits, breads, cakes, table beverages, and cheese (except Swiss). 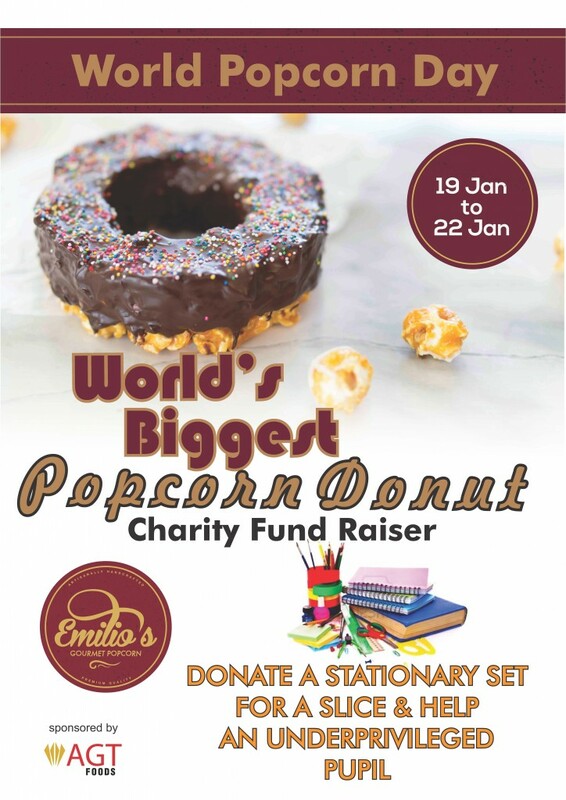 Of 1281 edible foods listed, popcorn is shown to have more calories than 1123 of the foods listed…A boy of high school age requires up to 3200 calories a day. Three ounces of popcorn will supply 343 calories, which is more than an equivalent serving of roast beef. AGT Foods Africa, a South African based agricultural production, processing and trading organization, was established in 1966. AGT Foods Africa is involved in all branches of the Agricultural sector including Crop Production, Cleaning, Grading and Processing, Marketing and Sales as well as the Export of speciality crops to a costumer base in over 50 countries around the world. AGT Foods Africa group is a long established business, with operations throughout Southern Africa. With the vast capacity at our fingertips, and a highly skilled and motivated management and work force, we can assure customers that whatever your requirements, AGT Foods Africa and its trading and supply operations will meet and surpass your expectations in price, quality, prompt deliveries and service. 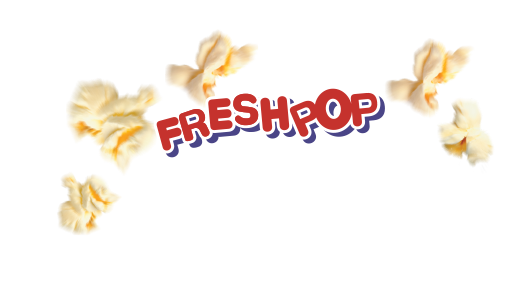 Please don’t hesitate to contact us with regards to Popcorn , one of our brands, products or companies or the website itself.